Disturbing yet practical, the Bird Trap and Cat Feeder makes feeding your cat simple at the expense of all the birds that like to fly around your yard. Unaware of it being a trap, a free flying bird will stop for a snack to ultimately get trapped inside. Later, when the cat is ready, the bird becomes dinner. What's wrong with the generic cat food out of a tin can? United State Patent 4150505 was filed in 1977 so you would think that through all that time some had to be made. I would love to see it in action, except that after the bird gets trapped, I'd open the cage and let it free. I wonder if PETA would have anything to say about this? I'm not sure if all of you are familiar with PETA, which stands for People for the Ethical Treatment of Animals. Their cause is that animals are not ours to eat, wear, perform experiments on, or use for entertainment. It doesn't seem like they are breaking too much ground on their cause. 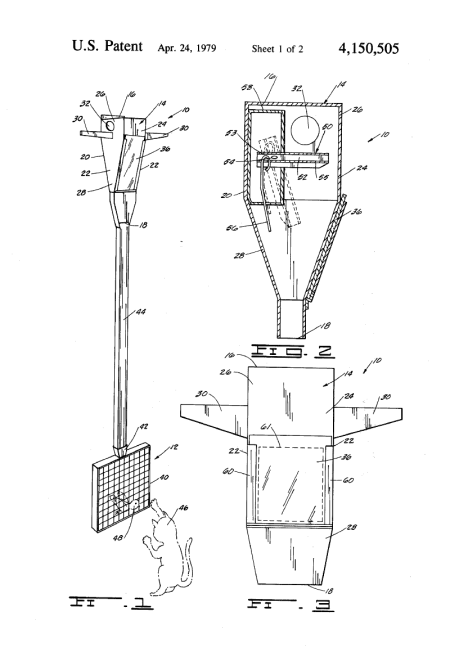 Not only is this patent disturbing and brutal, it's completely not practical. From the looks of it, the birds stand on the posts on the outside and somehow get trapped in the top and fall down a tube and get stuck in a cage. I guess I would need to see one in person to understand the mastery that is the Bird Trap and Cat Feeder. I cannot tell you to go and pick one of these up... , well maybe after a couple drinks. Unless you plan on having a ton of wild cats just hanging out in your back yard because you keep feeding them. You can get one for the lady down the block where all the cats hang out though. Our Guest Blogger, Andrew Portela, is a seasoned freelance writer and an avid gadget enthusiast. ...PETA is making a lot of ground, which is why both their membership numbers and vegetarianism in general has been increasing radidly, especially in the past several years. Other than that, your blog just makes me wonder what kind of people not only come up with ideas like this but then go ahead and pursue it all the way to a patent. Some folks just have too much time on their hands I suppose. Wow. I'm all for animals and watching out for them, but it has been repeatedly proven that PETA has given money to animal liberation groups that use terrorism tactics. The president of PETA has said that people should not have pets. If most people in PETA actually knew all the bull PETA was pulling, they wouldn't have a damn thing to do with the organization. As for this invention. I added it to my stupidest products ever series on my blog. It's horrible. As I said over there, if a bird actually did get caught in this thing, it was probably sick and dying -not an animal you want to feed to your pet.